I am easily amongst one of the last people to have read Blood Red Road and while I was worried that my expectations would not be fulfilled, Young proved that my worries were baseless. Not only were my expectations exceeded, I was also rewarded with the thought that my wait for the sequel of this fantastic debut would be far less than that of anyone else. 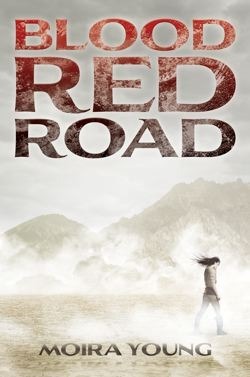 While Blood Red Road remains to be a dystopian novel like any other with a protagonist embarking on an epic journey, its true beauty lies in its creative writing style, realistic quality, and fleshed-out characters. I have thoroughly enjoyed immersing myself in this brutal, but rich, world and am already counting down the days till the release of Rebel Heart. In the distant future that Saba resides in, her entire life has been spent in isolation with her family. Yet, Saba has never felt deprived of company as long as she has her twin brother, Lugh, and her wearied father, who claims to read the future in the stars, by her side. But, when Saba’s father is murdered and Lugh kidnapped by four mysterious horsemen, Saba’s life is turned upside down. Now, she must embark on a journey with her younger sister, Emmi, to find and reclaim her brother before his life is in mortal danger. Yet, most surprising of all, will be the strength Saba finds within herself and more than that, a heart where she previously thought there was none. Blood Red Road has received a lot of mixed reviews ever since its release. While there have been gushing and adoring fans, there have also, in equal part, been repulsed readers. Why? Blood Red Road is written in a dialect that takes awhile to understand, yet, it perfectly embodies the culture and state of this future civilization where books are practically non-existent and education is a thing of legend. Furthermore, Blood Red Road lacks quotations marks but this, like the purposeful dialect, only further renders the reader into the true mindset of its protagonist, Saba. Saba is a tough character to like – she’s rude to those who try to help her, she is never grateful for what she has, and most heart-breaking, she is impossibly mean to her younger sister. Yet, for all her feral nature, Saba loves her brother very dearly and it is this love for him that propels her onwards to some of the most difficult and dangerous tasks she will face. I loved not only getting to know Saba and getting inside her head, I also loved watching her grow. Young’s development of Saba’s character was realistic to a point where I simply have to admire her writing style. While Saba may have had one or two moments of shining kindness where the reader thought she was changing for the good, Young proved that true change took longer than that and made Saba resort to her usual snippy self and bury herself in her cloak of indifference. So, while Saba took two steps backward for every one step she took forward, I truly enjoyed reading her flawed character and her struggles to become a better person only made her perfect in my eyes. While I liked the pacing of this one immensely, I found that it was the sibling relationships, unlikely friendships, strange compromises, and inexplicable romances that made this novel shine. Saba’s relationship with Emmi was easily my favorite as it was heart-warming while managing to be realistic. Furthermore, we were able to not only see Saba’s growth, but Emmi’s too as she grew into a strong and courageous girl. In addition, Saba’s unlikely friendship with the Free Hawks was extremely compelling. I’ll just come out and say it – the Free Hawks are every woman’s dream. I think we all aspire to be headstrong women who can support one another and be there for each other and that is exactly who these women are. While we got to know specific Free Hawks such as Epona, Ash, and Maev more personally than the group as a whole, I admire the simple idea of their group itself. Furthermore, I loved the friendships that Saba sustained with these remarkable people as well. For all my gushing about relationships, the true one that demands to be highlighted is that between Jack, a charming traveler, and Saba. I’ll admit it – I was skeptical about these two at first. While Jack and Saba’s relationship seems to originally stem from a bout of insta-love, Young makes it work as Saba is as confused by the emergence of her feelings towards Jack as the reader is. Furthermore, despite the chemistry these two feel together, their true relationship grows through conversation, understanding, and a deep-seated mutual respect for one another. In addition, Jack isn’t afraid to point out Saba’s flaws when everyone else is. Together, they make each other better people and I was rooting for their romance (and make-out scenes) the whole way through. Blood Red Road is simply one heck of an adventure. It barely leaves you with any room to catch your breath and its cast of secondary characters is almost better than the scintillating plotline itself. Plus, this novel contains a set of villains who are not only truly evil, but they are clever as well! While I hated these villains with a passion, I could not help but love what they brought to this story and while Blood Red Road is quite nicely wrapped up, there are still plenty of loose threads to pick up on in the sequel. So, all in all, this is one book you simply cannot miss. It’s a dystopian that demands to be read with characters you won’t want to say good-bye to. I am eagerly awaiting the sequel with bated breath and hope against hope that Moira Young will, once again, exceed my expectations of her writing and deliver a follow-up even more stunning than her debut! Great review, Keertena. This sounds pretty awesome. I'll definitely have to pick it up (since you're not the only one to have not read this!) After all, I do tend to stray away from reading some of the hyped books until long after they're out. Great review! I'm so glad you enjoyed it, I was gushing over this one too. Just a little more than week now and then the sequel's available to buy. I pre-ordered it on Amazon. You're doing one better than me... I've had a copy since last year and I STILL haven't read this damn book!! I definitely hear the most about the dialect used and I'm really intrigued to see how I'll respond to it. From the way you describe it, it sounds like it will only invest me further into the story. I LOVE how flawed and complicated Saba sounds, definitely not your typical YA heroine. And the relationships seem so well developed. ARGH. You do realise my TBR is already bursting at the seams and cannot afford for another book to topple it by trying to jump ahead of the others? Either you don't know or you just don't care, because when you write amazing reviews like this, I have a hard time resisting urges to go grab my copy now. Cannot wait to read this! Awesome, I'm thrilled that you enjoyed this! Well, now you don't have to wait so long for the sequel, do you? :) Only two-ish months left to go! (I'm counting down the days, ha). I think your thoughts about how every woman aspires (or should) to be like a Free Hawk is perfect. I also love how the author never presented the females in this book as Women Who Have Balls (they have to "prove" themselves to men that they are capable, for example) but rather, it's a celebration of female power. All the women are strong, intelligent, independent, and I really appreciated that during my read of this.